In spring Pemphigus gairi and Pemphigus phenax form yellowish or reddish elongate pouch-shaped galls on black poplar (Populus nigra) (see first picture below). 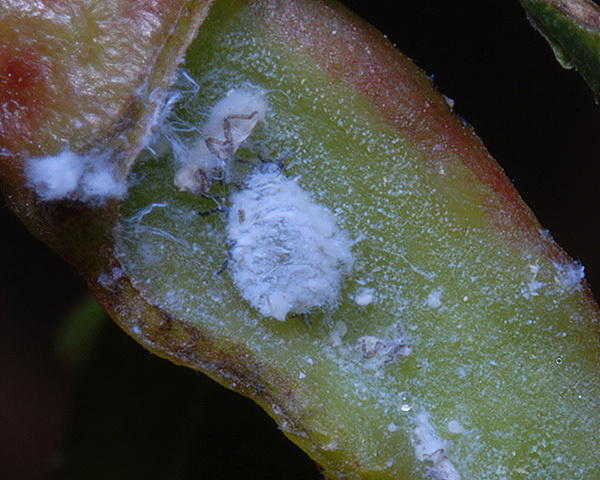 The galls are usually more or less in the middle of a leaf, and are on or near the midrib. 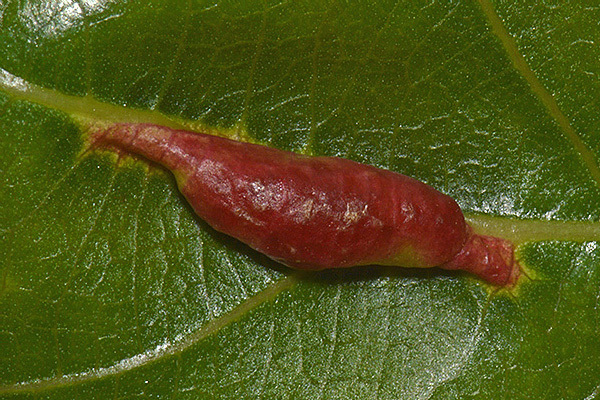 The slit-like opening on the underside extends over the entire length of the gall. (cf. 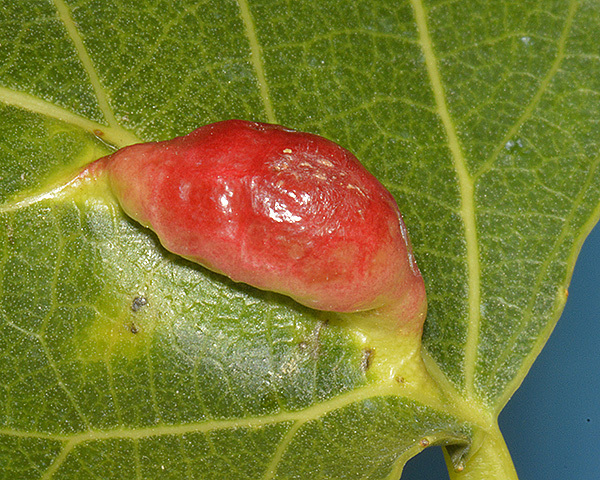 Pemphigus populinigrae which induce broader pouch-shaped galls with the opening extending over part of the gall). Galls of Pemphigus gairi are rather thin walled, slightly shining, green-yellow in colour and only rarely slightly reddish. The swelling is nowhere more than four times the normal thickness. Galls of Pemphigus phenax have a slightly wrinkled surface, more or less red in colour and often with yellow sides. The swelling is over five times the normal thickness. Given the features above (colour and thickness) the gall below would appear to be Pemphigus phenax. Note however, that some authorities (e.g. Blackman) believe that the galls of these two species are too similar to differentiate. 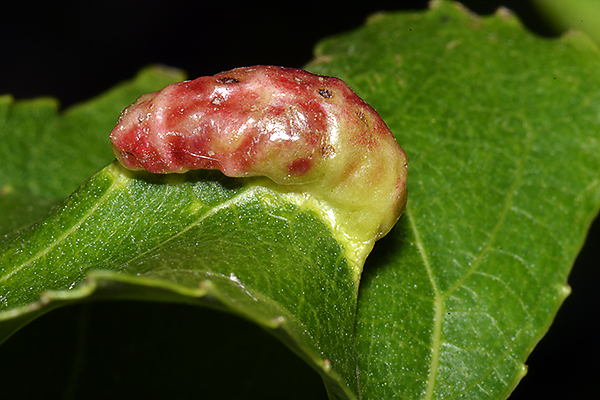 Inside the gall the developing Pemphigus fundatrix is dull green or greyish green, and is covered with wax. 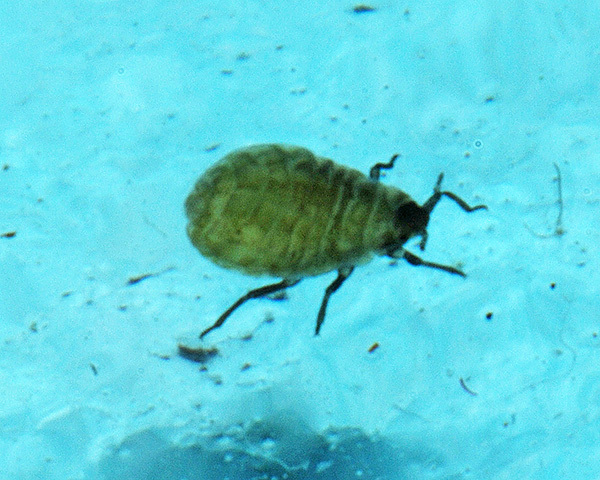 The 4-segmented antennae are about 0.12-0.15 times the body length. 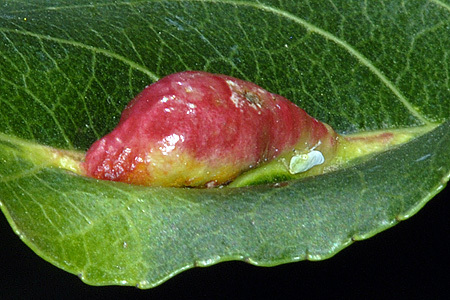 The offspring of the fundatrix develop into winged viviparae (see second picture above) that emerge from these galls in summer through an opening on the underside of the leaf. They have a black head and pterothorax, small siphunculi and a rather elongate greenish wax-dusted abdomen. For Pemphigus gairi the axial length (= distance between two most distant points) of the primary rhinarium is less than 35 µm. The third antennal segment has 7-12 secondary rhinaria, the fourth has 3-6, the fifth has 1-4 and the sixth has 1-7. For Pemphigus phenax the primary rhinarium on the fifth antennal segment is usually much enlarged, its axial length 35 µm or more with small islands. The third antennal segment has 6-12 secondary rhinaria, the fourth has 2-3, the fifth has 0-3 and the sixth has 2-5. 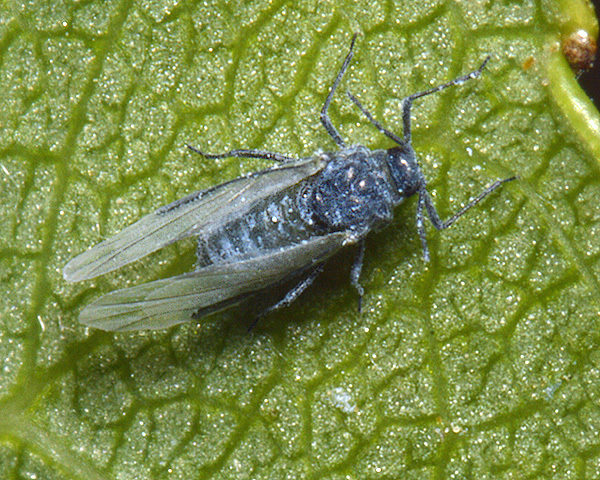 Pemphigus gairi host alternates between poplar and fool's parsley (Aethusa cynapium). In summer they live on the roots of the secondary host. Pemphigus gairi has been found in England, Czech Republic and Ukraine, but it probably occurs widely in Europe. Pemphigus phenax host alternates between poplar and the roots of wild and cultivated carrots (Daucus carota). Apterae on carrot roots are pale lemon-yellow to yellowish white with white wax. Colonies may also persist parthenogenetically on carrots that remain in the ground through the winter. Pemphigus phenax is found in northern Europe (England, Denmark, France, Germany, Netherlands, Sweden), and is also recorded from Turkey and west Siberia. 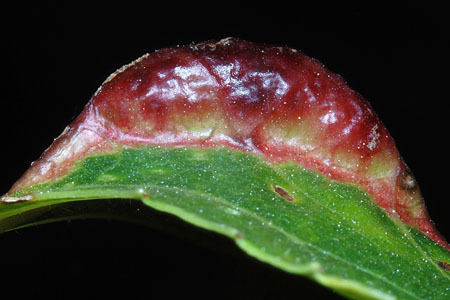 The galls of probable Pemphigus phenax that we have found are quite variable in appearance, but all are predominantly red with a little yellow on the sides. 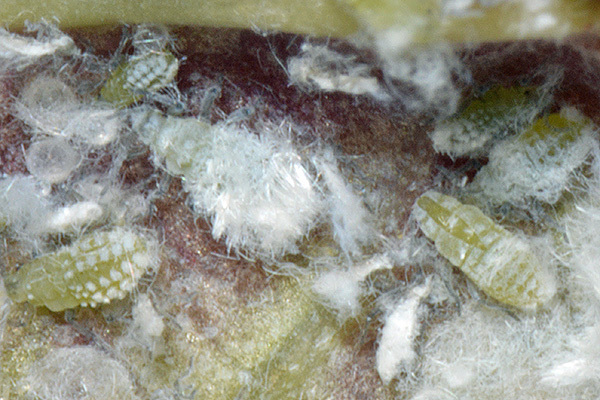 In May, most of the galls contained only the wax covered fundatrix (see picture below). We removed the wax from the one in the first picture below to show distinguishing features. The fundatrix is green or greyish green and has no siphunculi. 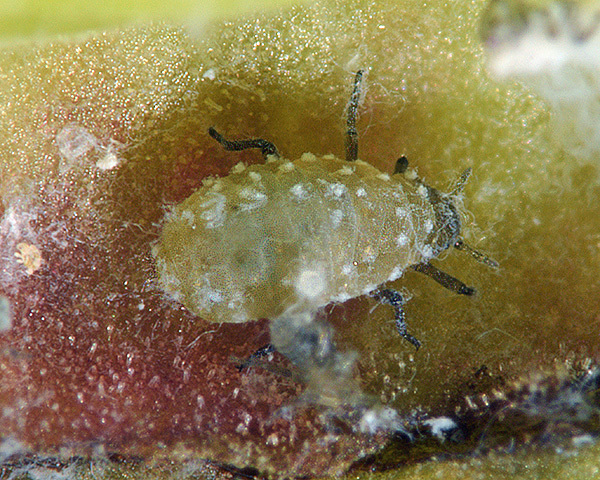 The grey aphid in the second picture below is most likely an old fundatrix which has lost most of its waxy covering naturally. A few galls were evidently older and contained many pale yellow immature alatae with varying degrees of wax coverage. The white wax patches mark the sites of the wax glands. The picture below shows the emergent alate. They have small siphunculi and a rather elongate greenish wax-dusted abdomen. Pemphigus phenax has been recorded from 2 Populus species (Populus ×berolinensis, Populus nigra), Pemphigus gairi has been recorded from 1 (Populus nigra). 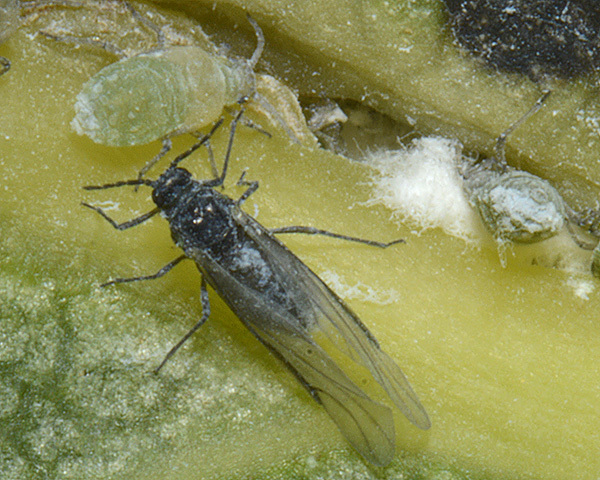 Pemphigus phenax has been recorded from 1 Aethusa species (Aethusa cynapium). 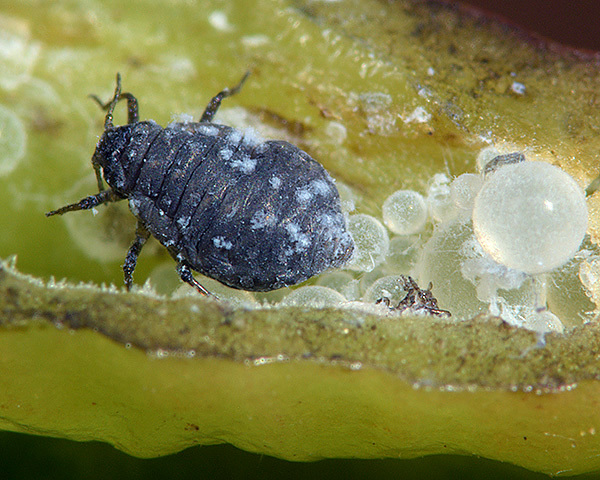 Blackman & Eastop list 8 species of aphid as feeding on fool's parsley (Aethusa cynapium) worldwide, and provide formal identification keys. Of those aphid species, Baker (2015) lists 8 as occurring in Britain: Aphis fabae, Cavariella aegopodii, Dysaphis crataegi ssp. aethusae, Hyadaphis foeniculi, Macrosiphum euphorbiae, Macrosiphum gei, Myzus ornatus and Pemphigus gairi. Pemphigus gairi has been recorded from 1 Daucus species (Daucus carota). Of those aphid species, Baker (2015) lists 16 as occurring in Britain: Aphis craccivora, Aphis fabae, Aphis gossypii, Aphis lambersi, Aphis spiraecola, Aulacorthum solani, Cavariella aegopodii, Cavariella pastinacae, Dysaphis apiifolia, Dysaphis crataegi, Hyadaphis passerinii, Myzus ascalonicus, Myzus ornatus, Myzus persicae, Pemphigus gairi, Rhopalosiphoninus latysiphon and Semiaphis dauci.